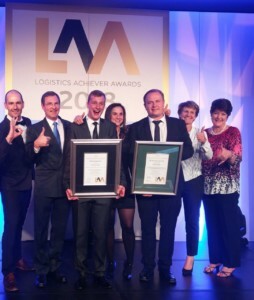 ZZ2 became the first back to back winner of both the Platinum Supply Chain Award and the Enviro Achiever Award at the Annual Logistics Achiever Awards. During a gala event in on Thursday 11 October 2018 in Johannesburg, companies who actively work towards minimising waste in their supply chain, were honoured. Last year ZZ2 won these awards for their work in the Tomato Division. On Thursday the Avocado Division was honoured. To be recognised, companies had to demonstrate compliance with national and international environmental regulations, show how green practices are implemented across their supply chain and indicate their success in reducing their carbon footprint. Representing the ZZ2 supply chain are Francois Schwalb, Clive Garrett, Frannes Joubert, Wilene Burger, Manie Potgieter, Michelle Rugani en Lisa Matthews.